Seated outside the restaurant Dopo La Spiaggia on a lovely brick patio sheltered by a screen of vines to one side and the outer wall of an antique shingled house (in which the main restaurant is located) we spy enormous yachts at the Marina and watch co-owner and chef Maurizio Marfoglia sporting a straw hipster hat. As he greets his guests, many who’ve known him for the eight years he’s presided over this space – that was formerly called Tutto il Giorno, you can sense his love for the restaurant and patrons whom he considers his friends. 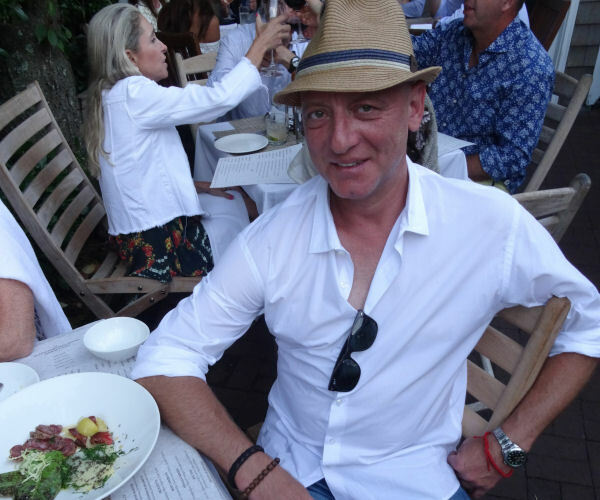 Owner/Chef Maurizio Marfoglia welcomes his guests to the Magnifico Dopo La Spiaggia in Sag Harbor. Maurizio (yes, we’re on a first-name basis as the hands-on proprietor periodically stops by our table to guide us in our choices throughout the meal) was in partnership with Gabby Karan (Donna’s daughter) and her husband Gianpaolo De Felice till last year when they split their mini restaurant empire with Karan holding onto the original name and the two eateries that still bear the original moniker in Southampton and New York. “It was a very amicable divorce,” says Maurizio who plans to continue vacationing with Gabby and her family as they have done for years. The name of the restaurant, Dopo La Spiaggia, which translates to “after the beach,” creates just the right tone for this chic casual hangout. Meanwhile, he has opened a second version of the eatery at the former Race Lane restaurant in East Hampton. We start with a drink from the Splash cocktail menu, which is a series of low-sugar, non-GMO and gluten-free mixers created under the Dopo brand. The mixers come in smart white bottles, which will be retailed soon but are now only available at the restaurant. We have a tasty Moscow Mule and Margarita, which our waiter tells us is popular along with the Splash Dark and Stormy and Cosmopolitan and can also be ordered as a virgin cocktail. 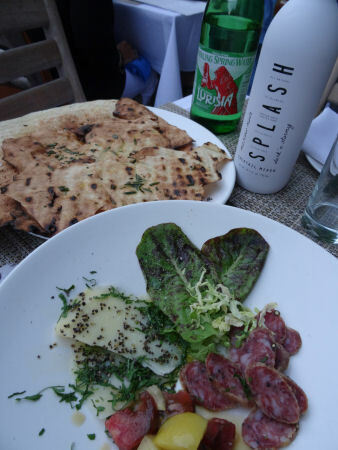 Owner/Chef Maurizio Marfoglia ‘s delicious hand-stuffed sausages, flatbread and Splash cocktail mixer at Dopo La Spiaggia in Sag Harbor. Despite the American flag visible in the park, we are immediately transported to Italy when a plateful of wafer-thin sheets of bread arrives. The pane carasau is imported from Sardinia, where it is baked on stone. In the Dopo kitchen it is scorched on the grill and drizzled with olive oil, rosemary and sea salt. Yummy, but there goes any thoughts of remaining gluten-free. Even if you are not a salami person, a special gift of tiny antibiotic and chemical free disks, hand-made by Maurizio himself, are superb. As is the house-made cheese swept with a flurry of basil chiffonade. A bite into the insanely light local cognac-braised shiitake ravioli explodes with umami juices, reminding us of Szechuan soup dumplings. Before we order a primi course of trofie, a dense twisted pasta, served with pesto, potatoes and green beans, Maurizio gives us a pesto lesson. He explains that pesto is a specialty in Liguria “where it is almost a religion.” It is traditionally preserved till fall and winter when it is served with potatoes and green beans – one garlic clove per person. The best, such as his, is made only with baby basil leaves. Given all that, we are humbled by the richness of the dish, especially since it was made sans pine nuts – a classic variation. 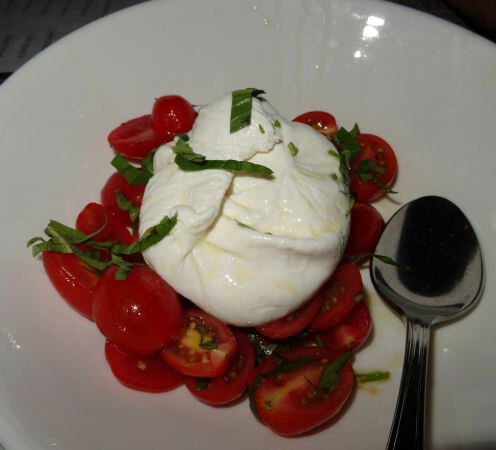 The burrata is fresh from a maker in New Jersey, and according to Maurizio “better than Italian,” which has a harder shell because it has to travel to far-away places. The soft center is a milky dream. For the scallops crudo the bi-valves were sliced thin and dressed with lemon zest, chives and olive oil to achieve a candy-like sweetness. A clever addition to the dish was sea beans, succulent little veggies that pop perfectly in your mouth. Best seafood dish ever at Dopo La Spiaggia in Sag Harbor. Other highlights included the pan-seared snapper accompanied by scrumptious black garlic puree (we only wish there had been more) and bright pickled cipollini onions. 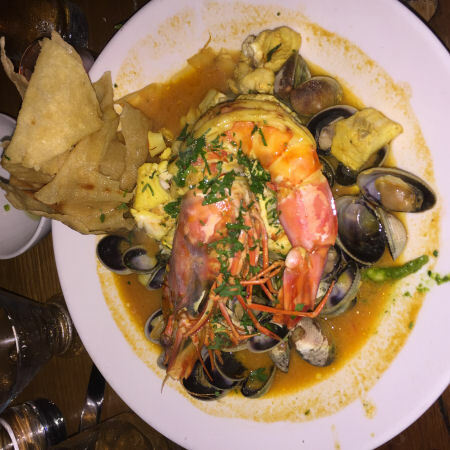 The brilliant seafood stew was a concoction of branzino, halibut, giant prawn, clams and calamari cooked down to a heady saffron broth. By the time Maurizio stops by to tell us he needs to go home to put his seven-year-old to bed, we too are ready to head home, completely satisfied.